Each month the California Employment Development Department (EDD) releases employment data for the prior month. This edition of San Diego's Economic Pulse covers February 2019. 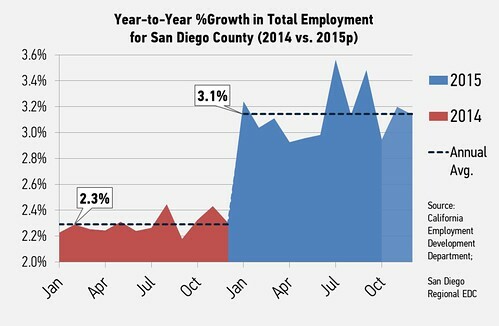 Check out EDC's research bureau for more data and stats about San Diego's economy. Thank you to Manpower San Diego for making this possible. · The region’s unemployment rate was 3.5 percent in February, down from a revised 3.8 percent in January, and unchanged from the year-ago estimate of 3.5 percent. · San Diego’s unemployment rate remains below both the state rate of 4.4 percent and the national rate of 4.1 percent. · The labor force grew by 3,700 workers during the month and is now up 24,600 compared to a year ago. · Total nonfarm employment is up 9,700 in February and up 19,900 over the year. 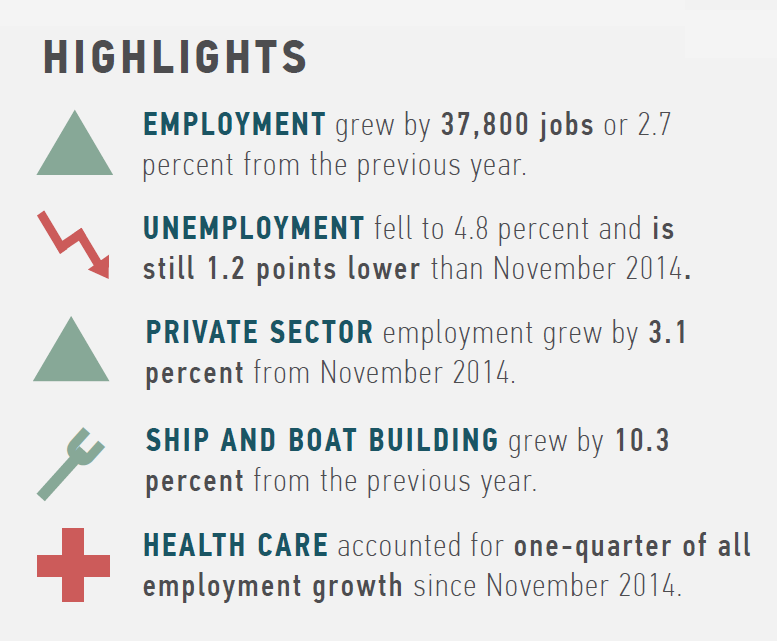 · The largest employment gain over the year occurred in educational and healthcare services, which added 6,900 jobs. Who has the best job in America, you ask? According to Glassdoor, data scientists do. And lucky for them, there's plenty of data science gigs available at tech and life sciences companies in San Diego. With a median base salary of $110K and a 4.25/5 job satisfaction score, this growing profession is giving rise to leaders in the digital age. It goes without saying that in a technology-driven world, the amount of available data will to continue to grow exponentially. And data scientists are exactly the types of people we’ll need to set up systems to digest and glean insight from all of that information. Data scientists are deep thinkers, problem solvers, and interpreters, driven by seeing the result of their algorithms in action. 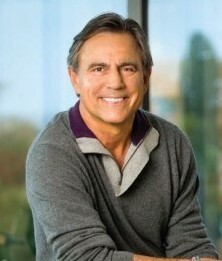 And most of all, they are needed by companies across the world; most especially, in San Diego. If you’re a data scientist interested in upgrading your life by living and working in San Diego, join us October 30 from 9am-12pm PST for a Virtual Career Fair with top employers: FICO, ResMed, Analytics Ventures Lab, and Booz Allen Hamilton. The web-based fair will give participants (you?) virtual access to recruiters from the companies just mentioned. These San Diego companies span defense, life sciences, and technology industries, providing a deep dive into all that a career in data science has to offer. You can explore company booths and chat with recruiters via instant-message or video call…and you don’t even need to leave your living room! Apply and register for free here. Data Science Virtual Career Fair from San Diego on Vimeo. The California Employment Development Department (EDD) released statewide county employment data today for the January 2016 period, as well as revisions for 2015. 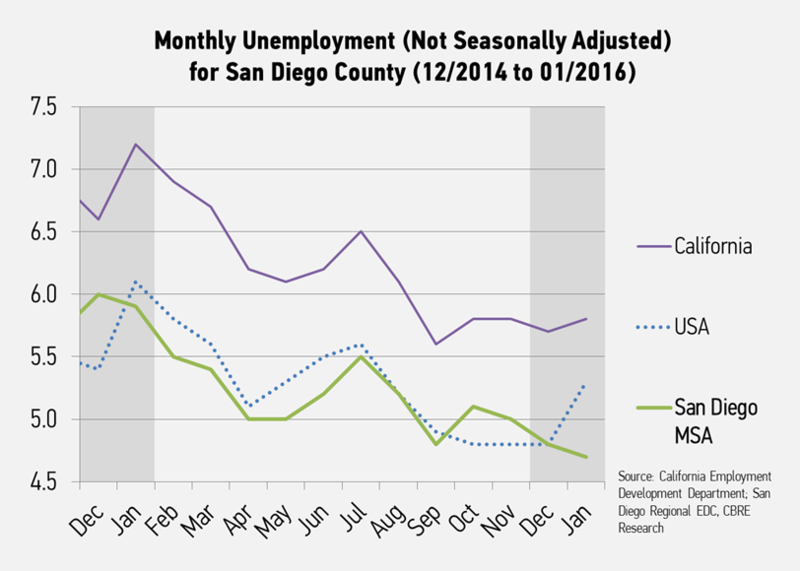 This month’s data shows that San Diego's labor market fundamentals remained strong, as unemployment continued to fall amid solid and steady job growth. The unemployment rate fell to 4.7 percent in January, the lowest since September 2007. The rate is down 0.1 points from the revised December number and 1.2 points from the previous year. 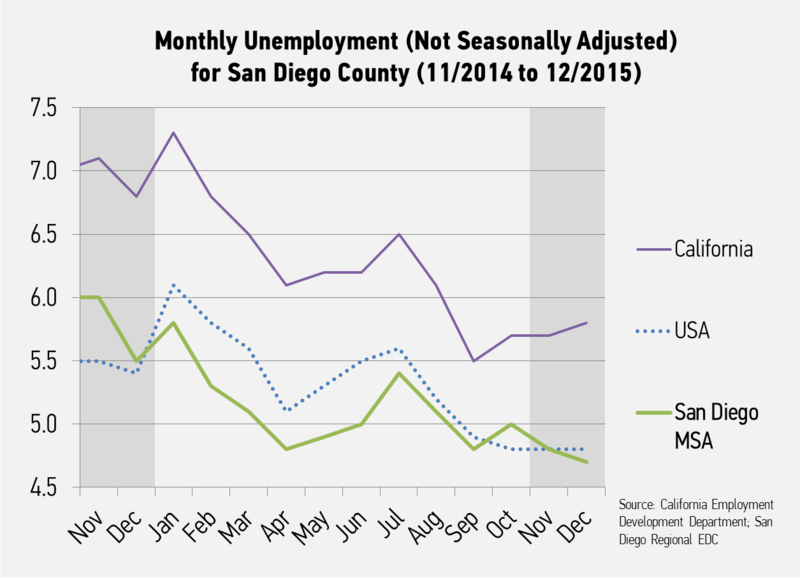 The San Diego rate remained much lower than the statewide unemployment rate of 5.8 percent. The national unemployment rate rose substantially to 5.3 percent, well above the San Diego rate. The rate dropped in part due to a typical seasonal decline in the labor force from December to January, but the annual labor force increased by 6,100, with 16,900 fewer unemployed persons since January 2015. Employment dropped back below 1.4 million in January, but seasonal declines are typical after the holiday season. More importantly, year-over-year employment went up by 38,200, a 2.8 percent increase. San Diego’s growth rate was again much higher than the 1.9 percent national rate. While the year-over-year growth slowed as 2015 progressed, the growth rate climbed again in January, which is a positive sign of momentum in the region. The private sector drove employment growth in January, as private employment accounted for 90.3 percent of all employment growth over the year. The total private sector grew by 3.1 percent year-over-year, out-pacing the private U.S. growth rate of 2.2 percent. Private growth was driven largely by service providers, but goods producers experienced another strong month. Manufacturers and construction companies drove 24.0 percent of private job growth in January. The two industries added a combined 8,300 jobs in January. The manufacturing industry in particular had a very strong month, posting 3.4 percent growth, compared to the national growth rate of 0.4 percent in the industry. Revisions showed that 2015 was an even stronger year than previously understood, with an annual 2015 growth average of 3.7 percent. Professional, scientific, and technical (PST) services, which is strongly associated with the region’s innovation economy, slowed substantially in January, but it is unclear if there are complications with the EDD revision. Prior to the revision, the industry showed6.6 percent growth in 2015. With revisions, that growth is only 1.9 percent. It is unclear if job growth previously categorized as PST was moved to another sector like manufacturing or management, as national revised figures don't show the same dramatic shift. Architecture and engineering, a subset of PST services, showed solid growth of 5.1 percent despite the overall PST figure. Other key drivers for growth included the region’s healthcare sector, which added 7,100 jobs and accounted for roughly one fifth of the region’s private job growth in January. Tourism experienced strong year-over-year growth, adding 5,900 jobs and contributing to 17.1 percent of growth. In all, the January report released today showed many continued positive signs for San Diego's economy. The dramatic adjustment to PST employment raises some questions, and we will have to wait and see what was behind this revision by EDD. Otherwise, the region posted another month of solid yearly job growth, in large part due to the booming manufacturing and construction industries. Unemployment fell despite statewide and nationwide increases, and growth was spread out across a variety of key high-wage and base sectors in the region. The California Employment Development Department (EDD) released statewide county employment data today for the December 2015 period. 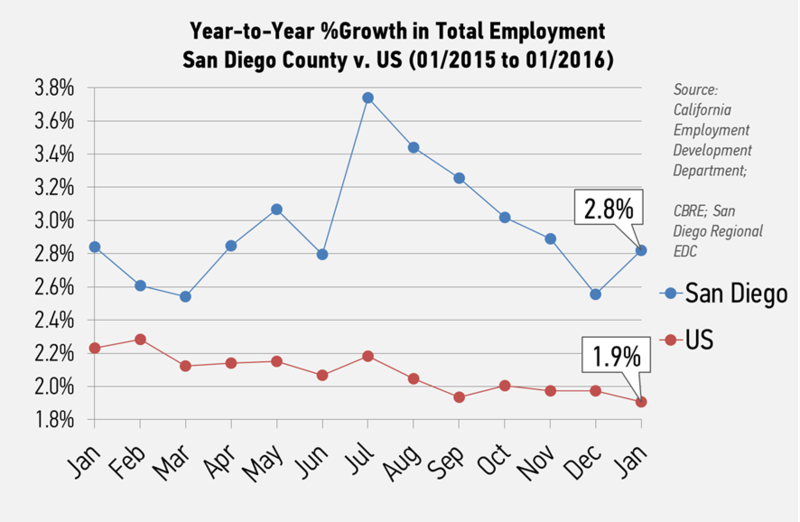 This month’s data allows for a complete picture for year 2015, and shows that San Diego’s economy grew at an accelerated pace in 2015 compared to recent years. The unemployment rate closed the year at 4.7 percent in December, the lowest since June 2007. The rate is down 0.1 points from the previous month and 0.8 points from the previous year. 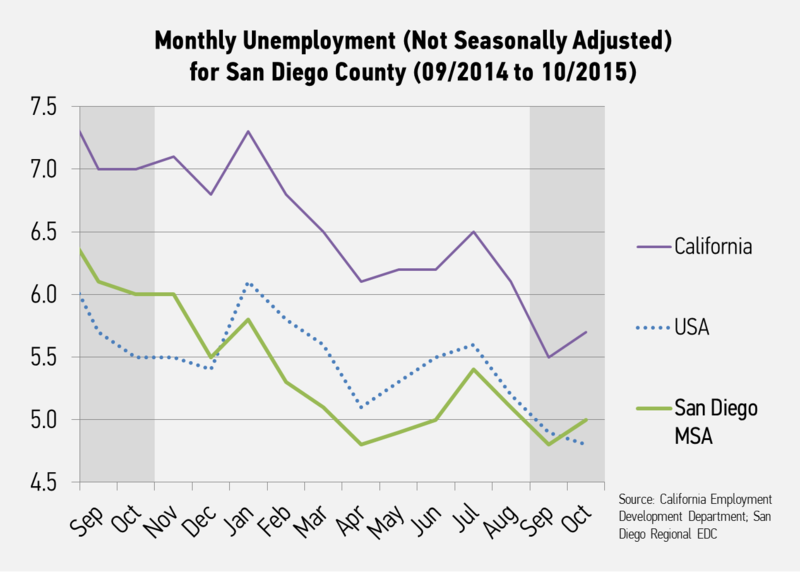 The San Diego rate remained much lower than the statewide unemployment rate of 5.8 percent. When averaged over the entire year, the unemployment rate closed at 5.0 percent for 2015, down substantially from the 2014 average of 6.4 percent. The 2015 annual average is the lowest since the recession. Meanwhile, the annual average labor force was up 17,700 from 2014, while unemployment claims were down 20,300, which indicates a healthy rate drop. The region’s year-over-year employment for December grew below the 2015 average. San Diego’s total non-farm employment grew by 37,500 jobs from December 2014 to December 2015—2.7 percent growth. San Diego’s growth rate was again much higher than the 1.9 percent national rate. In total, the San Diego region averaged 3.1 percent annual growth in 2015, compared to only 2.3 percent in 2014. This was the highest annual percent growth rate since 2000, as the region added 41,400, the most jobs added since 1999. The private sector drove employment growth in 2015, as private employment accounted for 91.7 percent of all employment growth over the year. The total private sector grew by 3.4 percent on average in 2015, out-pacing the private U.S. growth rate of 2.1 percent. Private growth was driven largely by service providers, but goods producers experienced a particularly strong year. Manufacturers and construction companies drove 15.9 percent of private job growth in 2015, and finished the year strong. The two industries added a combined 6,000 jobs in 2015, the most since 2004. The manufacturing industry in particular added the most jobs and experienced the highest annual percent growth rate since 1998. The boom in the construction market is likely a response to demand pressures in the commercial and residential real estate markets, as quality space is becoming increasingly scarce, according to CBRE MarketView reports. The growth in manufacturing and wholesale trade are putting pressure on the industrial market in particular, as the industrial vacancy rate in Q4 2015 was at the lowest ever recorded. Professional, scientific, and technical (PST) services, which is strongly associated with the region’s innovation economy, grew by 6.6 percent in 2015, which was the highest growth rate among major industries in the region (tied with construction). The 2015 growth rate was the highest posted since 2005 in the industry. 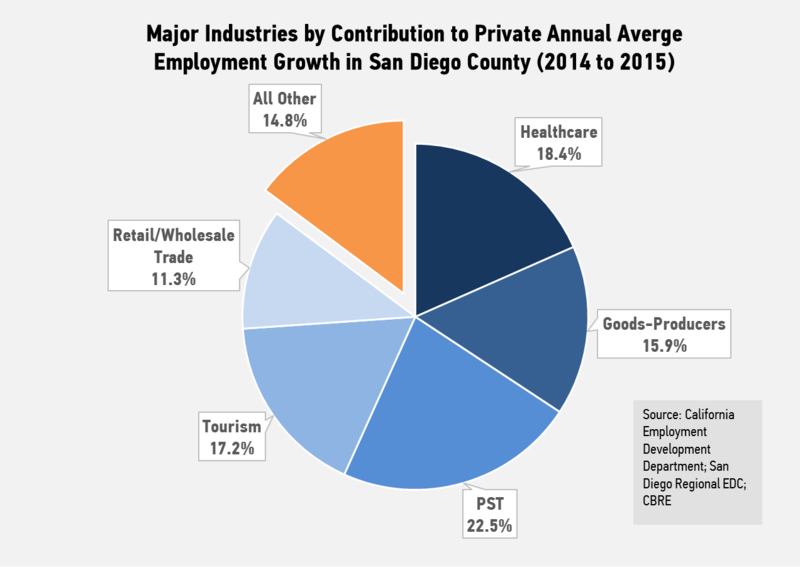 PST services accounted for more than one fifth of all private annual job growth in San Diego. Comparatively, the national PST sector grew by only 3.6 percent in 2015. Scientific research and development services, a subsector of PST that represents many cleantech and life science companies, grew by 5.2 percent. Other key drivers for growth included the region’s healthcare sector, which added 7,000 jobs and accounted for roughly one fifth of the region’s private job growth in 2015. Tourism experienced another seasonal hit in December, but the annual average was strong. 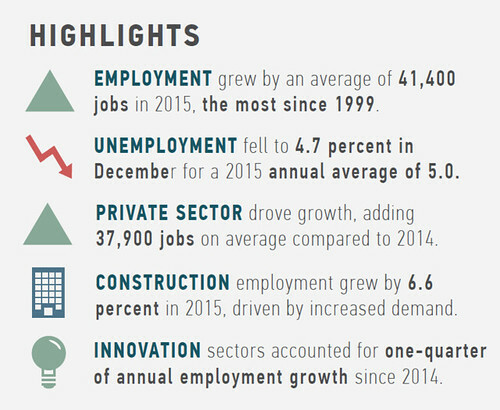 The industry added 6,500 jobs in 2015, a 3.7 percent growth rate. Growth slowed in the latter half of the year, particularly in food service and drinking places, which was driving higher growth earlier in 2015. With a full year of 2015 data on the books, it was a very positive year for San Diego’s economy. The national economy showed tepid growth throughout the year, while San Diego consistently looked much stronger than the country as a whole. Key industries like manufacturing, construction, health care, and PST services had impressive, and by some measures, record years. 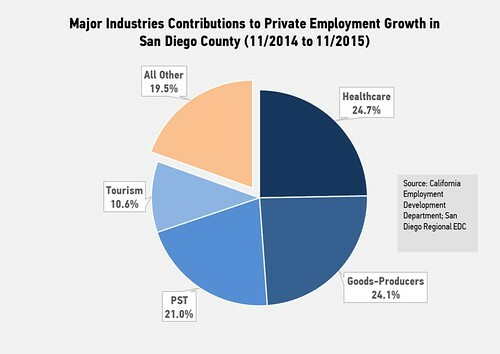 While concerns around decreases in federal spending for science and defense will likely thwart some expectations for 2016, other factors like the Department of Defense’s shifting focus toward cybersecurity and national trends toward manufacturing re-shoring could prove promising for San Diego. 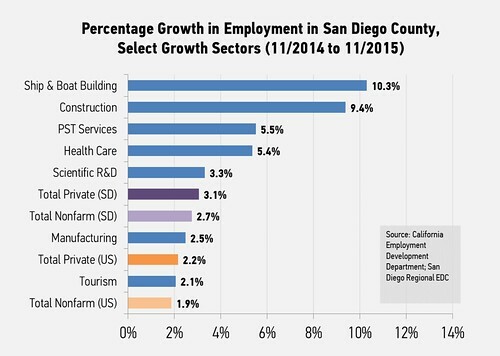 Given these trends, future outcomes remain largely uncertain, but San Diego’s economy appears well positioned for growth through 2016. The California Employment Development Department (EDD) released statewide county employment data today for the November 2015 period. This month’s data indicates that San Diego is showing strong signs of growth in the local economy as we near the end of 2015. The unemployment rate fell to 4.8 percent in November, down 0.2 points from the previous month. In October, the region experienced a large jump in the labor force without a large jump in employment, which caused the unemployment rate to rise back to 5.0 percent. The labor force stayed virtually the same in November, but higher employment and lower unemployment brought the rate back down to 4.8 percent. The number of unemployed fell by 2,000 from October to November, indicating that the fall in unemployment was healthy and not due to a reduction in the labor force. The rate is now 1.2 points lower than the previous year and on par with the national unemployment rate at 4.8. 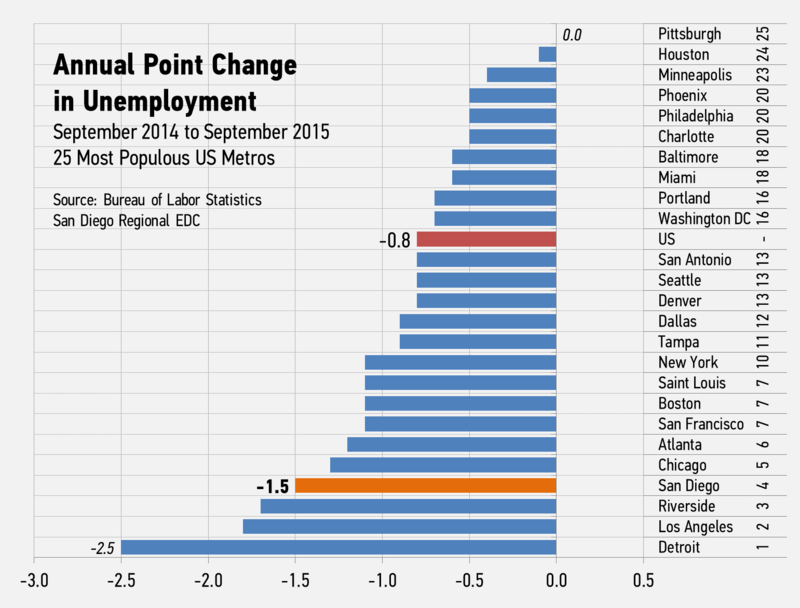 The region remains much lower than the statewide unemployment rate of 5.7 percent. The unemployment rate is now expected to end the year in the mid-four percent range in December, resulting in an annual average of about 5.0 percent for 2015, down substantially from the 2014 average of 6.4 percent. The region’s overall year-over-year employment grew, but below the 2015 average of 3.1 percent. San Diego’s total non-farm employment grew by 37,800 jobs from November 2014 to November 2015—2.7 percent growth. San Diego’s growth rate was again much higher than the 1.9 percent national rate. 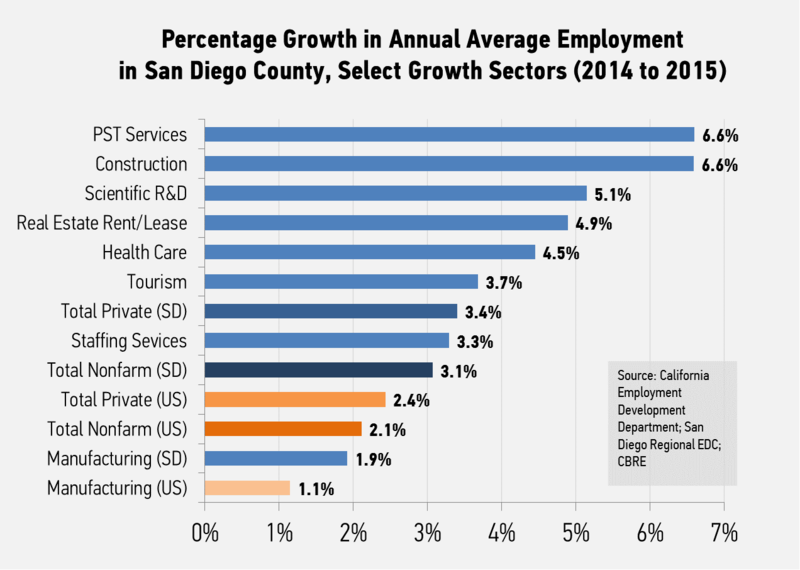 The San Diego region is still expected to average 3.1 percent annual growth in 2015, compared to only 2.3 percent in 2014. Year-over-year private sector growth continued to drive the economy, as private employment drove 92.1 percent of all employment growth. The total private sector grew by 3.1 percent, out-pacing the private U.S. growth rate of 2.2 percent. Private growth was driven largely by service providers, but goods producers experienced a particularly strong month. Goods producers like manufacturers and construction companies drove 24.1 percent of annual private job growth. This was due to both strong growth in those industries and uncharacteristically weak growth in service providing industries like professional and business services and trade. From November 2014 to November 2015, the manufacturing industry added 2,400 jobs—a 2.5 percent growth rate. The ship and boat building industry continued to grow at an outstanding rate of 10.3 percent. Meanwhile, the construction industry added 6,000 jobs and grew by 9.4 percent. Continued growth in goods producing industries remains a positive sign for the region, as these jobs tend to be accessible and pay above the median wage for the region. Professional, Scientific, and Technical (PST) services, which is strongly associated with the region’s innovation economy, grew by 5.5 percent and was one of the highest growth industries in the region. 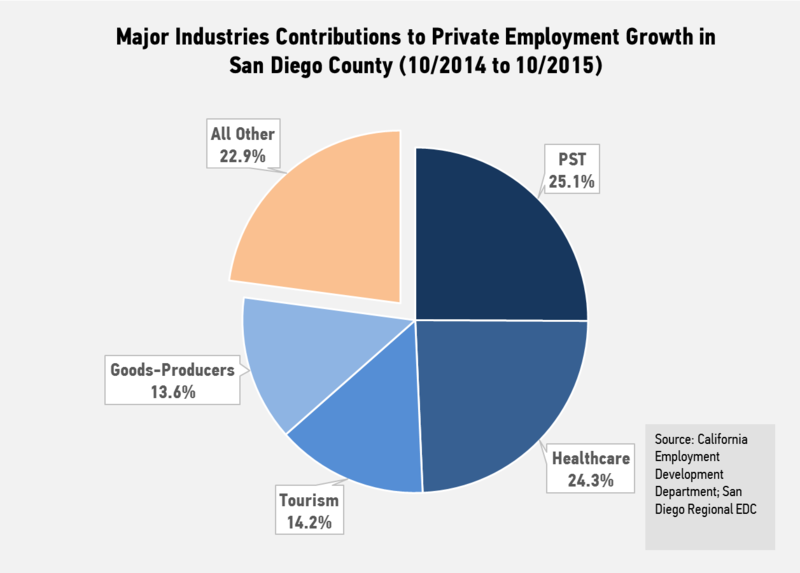 PST services accounted for roughly one fifth of all private annual job growth in San Diego. The national PST sector grew by only 3.6 percent. Scientific research and development services, a subsector of PST that represents many cleantech and life science companies, grew at a relatively low 3.3 percent compared to previous months. Other key drivers for growth included the region’s healthcare sector, which added 8,600 jobs and accounted for roughly one quarter of the region’s private job growth. Tourism experienced a major seasonal hit last month, but rebounded slightly in November. The industry added 1,100 jobs from the previous month and 3,700 overall since last November. The annual growth rate in the industry has slowed in the latter half of the year, but still growing, particularly in food service and drinking places. November’s employment numbers included more positive signs for the region’s economy, particularly when compared to the year before. The region has 13,200 more people in the labor force, 17,000 fewer unemployed, and has added more than 37,000 jobs. The growth rates have slowed in recent months, which may be a reflection of slowing national trends, an indication of mounting issues in the economy, or a brief blip in an otherwise outstanding year. Annual growth rates have varied throughout the year, but have consistently remained above state and national trends, with growth concentrated in high-tech and high-wage sectors. With one month of data remaining in 2015, all signs point to a solid overall year for the region’s economy. Recently, EDC released its September Manpower Monthly Employment Report. Since then, the U.S. Bureau of Labor Statistics has released September employment data on all U.S. metros, which allows us to analyze some key indicators across geographies. Click on images to enlarge in a new window/tab. At 4.6 percent, San Diego’s unemployment rate ranked 9th among the 25 most populous U.S. metros. 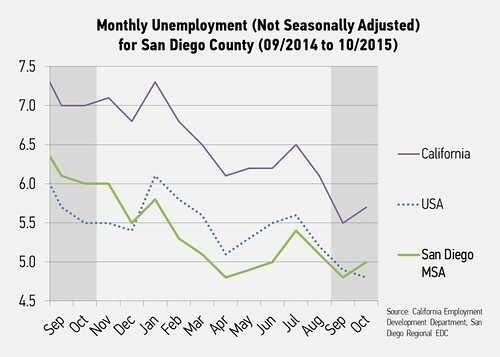 From September 2014 to September 2015, San Diego's unemployment rate fell by -1.5 percentage points, which ranked 4th. 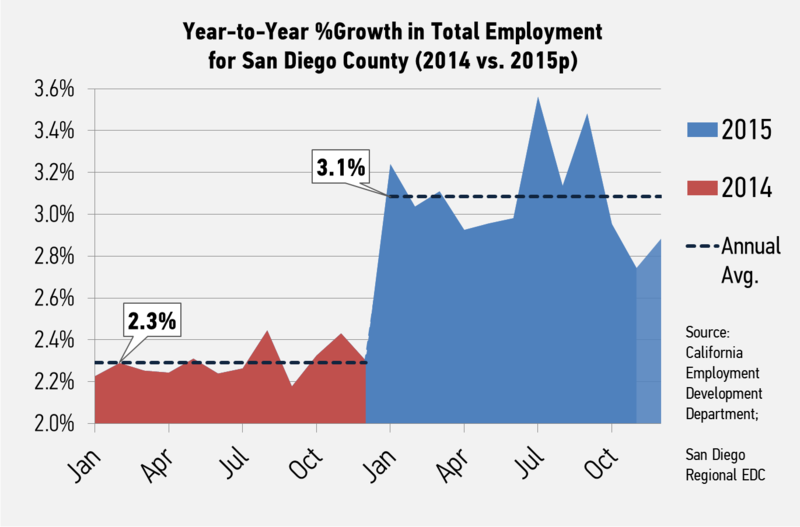 San Diego's total employment grew by 3.5 percent from September 2014 to September 2015, which ranked 2nd. 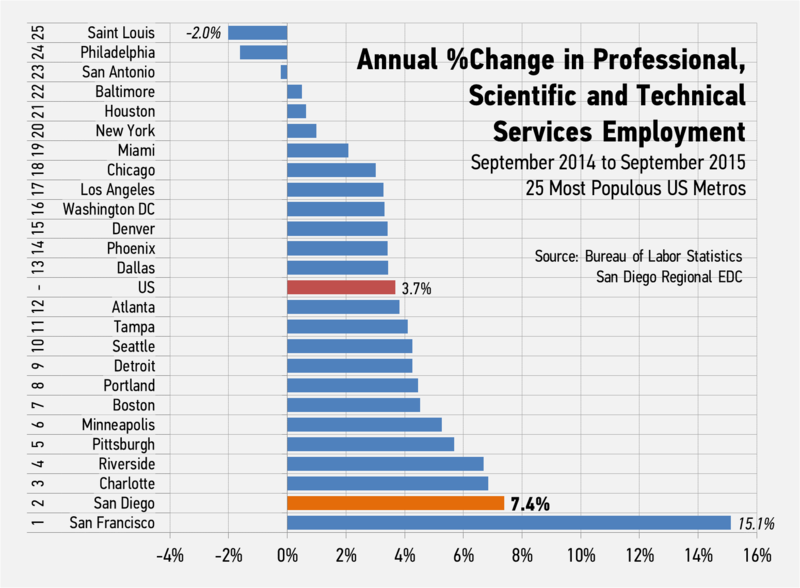 San Diego's employment in professional, scientific and technical services (PST) grew by 7.4 percent, which ranked 2nd. Manufacturing in San Diego grew by 2.6 percent from the previous year, the 4th highest growth rate. 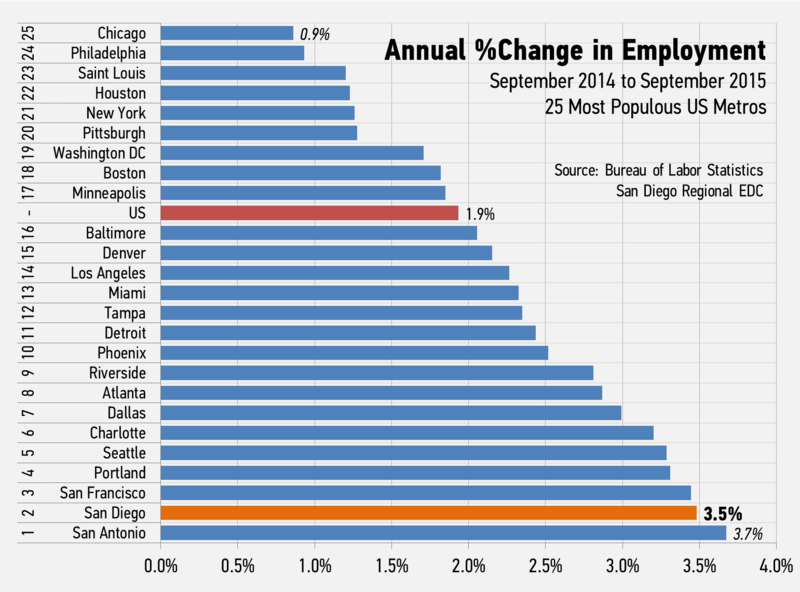 The Bureau of Labor Statistics (BLS) recently released employment data for the September 2015 period for all U.S. metro areas. At 4.6 percent, San Diego County’s unemployment rate fell by 1.5 points from this time last year. This was the 4th largest drop in the nation, among the 25 most populous U.S. metros, and the three metros with larger drops have the three highest unemployment rates. That fall put San Diego's rank at 9th among major U.S. metros and it remained below the U.S. overall rate of 4.9 percent. 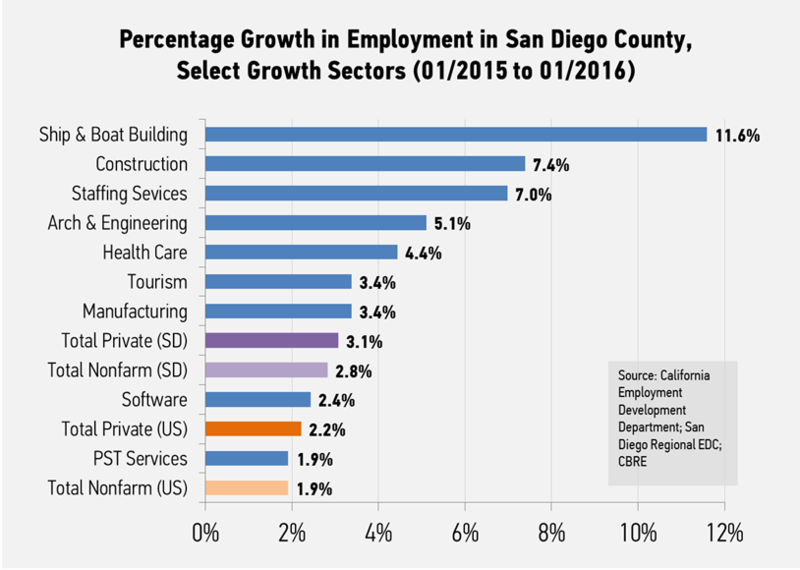 When looking at employment growth, San Diego outpaced most of the nation. 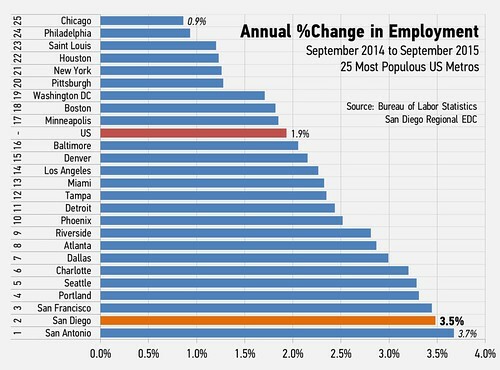 From September 2014 to September 2015, the region's employment grew by 3.5 percent, which ranked 2nd among the 25 most populous U.S. metros. The U.S. average growth rate was at only 1.9 percent. 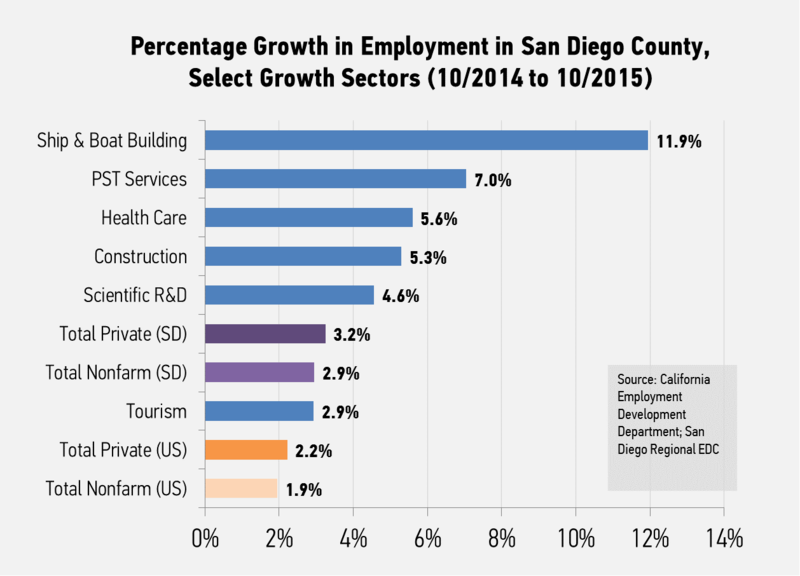 Growth has slowed substantially across the U.S. in the past few months, but San Diego has consistently outpaced the national employment growth this year and has been among the top competitive metros in the nation. San Diego's innovation economy is largely driving the region's growth. The region is outpacing all other major metros in professional, scientific and technical services (PST) growth except San Francisco. PST is a sector of the economy very heavily associated with the region's innovation clusters. Much of the companies and employment in clusters like biotechnology, biomedical products, cleantech and information technology fall within the PST sector. Employment in the region's PST sector grew by 7.4 percent since last September, the 2nd most out of any metro shown here. This figure was double the U.S. average and far ahead of other top tech markets like Seattle, Boston, and New York, which is a positive sign for the state and region's key traded clusters. 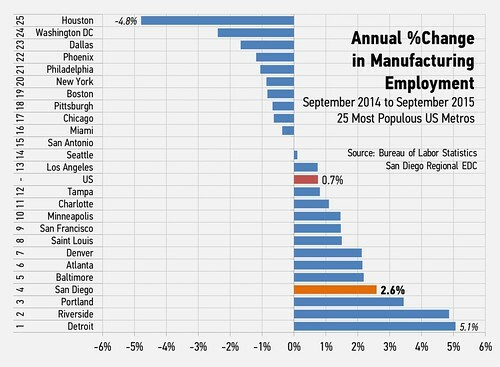 San Diego's manufacturing sector also led most of the nation. Manufacturing is another key industry for growth in the region, not only because manufacturing jobs are accessible and pay well, but also because certain manufacturing subsectors are critical to the region's innovation clusters. From September 2014 to September 2015, manufacturing employment grew by 2.6 percent. San Diego's manufacturing employment growth was more than triple the U.S. rate of 0.7 percent. The region recorded the 4th highest growth rate among major U.S. metros. Only Detroit, Riverside, and Portland showed stronger growth than San Diego. So while many key peer metros and the nation as a whole show signs of slower growth, San Diego's economy continues to buck that trend. More importantly, critical sectors like PST and manufacturing are not only showing signs of growth, they're outpacing nearly all of the region's key peers. EDC will be releasing the Manpower Employment Report with October 2015 data for San Diego on Friday, November 20th. Thank you to Manpower-SD for their ongoing support of EDC's employment trends research.